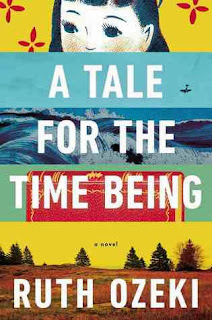 I contemplated not even reviewing this book--but since I've been telling everyone I know to read, I thought should at least attempt to put my thoughts about A Tale for the Time Being into writing. There is so much going on this novel that it is deserving of a dissertation, not a review. We have Nao, the troubled teenager who grew up in the Bay Area and now finds herself a stranger in homeland of Japan. As if being a teenager was not hard enough, Nao is dealing with her father's mental instability at home and truly horrendous bullying at school. Somehow, Nao's diary and a seemingly unrelated artifacts are very carefully wrapped up in a cocoon of plastic bags and a Hello Kitty lunch box wash up on a British Columbia beach and a writer, Ruth find them. Now, I don't know how autobiographical this is--but the character is Ruth and the author of this book is Ruth. They both live in British Columbia. They both had American fathers and Japanese mothers. They both have husbands named Oliver. I really don't know if a reader can take it any farther than that, but I found it strangely effective to think that the Ruth in the book is, in fact, Ruth Ozeki. Ruth is pulled in by Nao's diary--and who wouldn't be? Nao is one of the best written teenage characters I've found in adult literature. The book alternates between Nao and Ruth and it sounds like that could be jarring, but it really isn't. I think the pacing of these transitions is especially effective in this book. It helped the reader to be grounded in two worlds--Nao's world of an indeterminate time period (present day, but how present?) and Ruth's more concrete world. In this contrast, there is something that Ruth Ozeki has done that no other author I've read so far can match. When telling a story from multiple points of view, there is always something that sounds like the author in both voices. Not here. Nao's voice is so utterly distinct that I wonder if Ozeki really did find something when she was beach combing. I had read great things about this book, and I expected to like it. I did not, however, expect to love it and to be as affected by it as I am. Do yourself a favor...read this book. Yes! I'm so glad you enjoyed this one, I certainly did. You are so right about the book having two distinct voices. I think that is so hard to pull off. She did it, beautifully. Wow, this book sounds very touching and unique. It's not often you write about a book being so affecting, and as someone who wants to escape to a happier place in reading, I'm usually one that avoids topics that are depressing rather than uplifting. But I am putting on my library loan list to check out! I didn't realize they made trailers for books. That is so cool! Thanks for sharing! I will look into this one! Glad to hear you enjoyed it! I have it and need to get around to reading it.